The writing under the animals says: Tibir Aka datu. The art of Tibir is based on the fight between a Cobra and a Mongoose. How does a Mongoose fight a cobra? 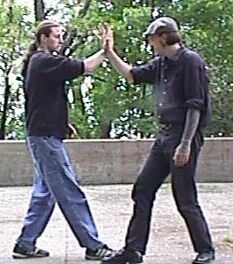 Since it is not practical to leave the hands down in an open posture we hold the hands in the earth posture. 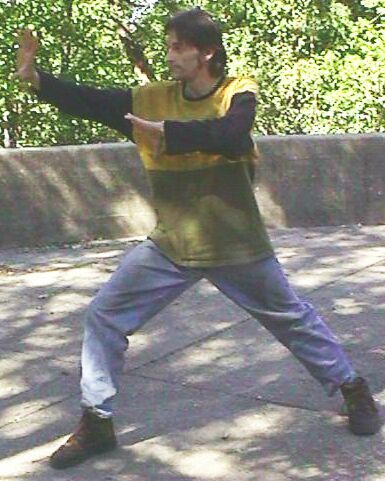 Note that in all postures the lower hand floats in front of the solar plexus and the high hand floats in front of the face. NOTE: THIS SEQUENCE GOES FROM RIGHT (step 1) TO LEFT (step 3). 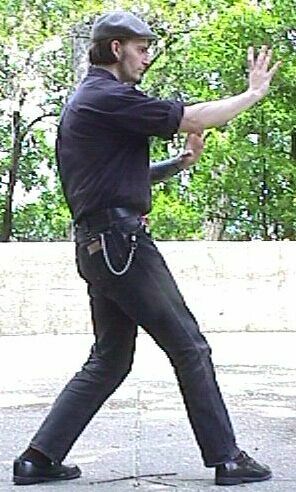 (Step 3) And then while my weight falls on my front foot, my hand turns away from me while it falls forward in an abbreviated arc towards the opponent's face, and then the weight rocks back into step 1. This motion is an excellent defense against an attack to the face or solar plexus. I have had students throw repeated shots at my face or solar plexus and used only the split as a defense. Properly done, it not only defends against the strike, but also counter strikes effectively! This cycle continues With the Mongoose circling and the serpent turning until the serpent tires or the Mongoose is struck. Even then the Mongoose may continue to circle and attack if he is struck. The manner in which these postures are used will be touched on below, but first lets examine them in light of weight distribution and our view of our defensive / offensive personal space. Think of the circle (Zagsi) as the boundary that you use to keep the opponent's strikes out of the castle, and the Ibsi as the line of engagement. 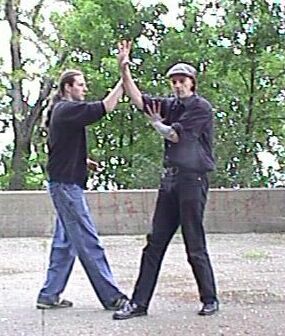 If the opponent strikes we move the hands to push the strike around and past us along the Zagsi circle. One may strike straight along the Ibsi or send a strike arcing along the Zagsi in an abbreviated arc to slam in from the side. "to move to the side of the opponent that is to the outside of his arm so that the arm is interposed between you and the opponent's chest. " 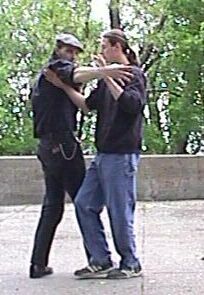 HERE BOTH PERSONS ARE ENGAGED ON THE OUTSIDE LINE WITH HANDS AND FEET. When on the inside line, the defender ends up being head on with the opponent, and the opponent has an easier time striking with a kick or a punch from his other hand. 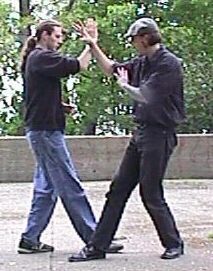 If the body and feet are on the outside line but the hand is not, the defender is at risk to a throw or counter attack with the fists or feet. HERE THE DEFENDER ON THE RIGHT, IS ON THE OUTSIDE LINE WITH HIS FEET, BUT IS ON THE INSIDE LINE WITH HIS LEFT HAND. AS A RESULT HE IS OPEN TO A NASTY TAKE DOWN FROM MY RIGHT ARM. THE HANDS AND BODY MUST BE ON THE OUTSIDE LINE EVEN WHEN THE FEET ARE NOT. In Tibir we always attempt to engage the upper limb at the forearm / elbow, and the lower limb at the knee / shin. Here are some examples of simple defenses using the four prime postures. All start with a Split engagement. 1.Defender (on right) engages the right-handed attack with a split on the outside line (the defender's feet are in the Cobra turns posture). 2. 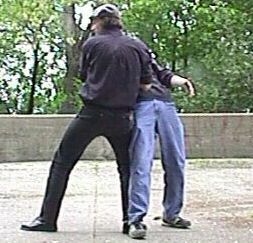 Defender brings his left forearm up under the attacker's right armpit while he brushes the attacker's right hand down, and across the attacker's center/Ibsi. In addition the defenders left knee engages the attacker's right knee from the outside line/Zagsi. 3. Defender uses a Half Circle Decompression (up &forward, down & forward) with his forearm towards the opposite shoulder to force the opponent to cross step (a very unstable posture open to takedown). 2. 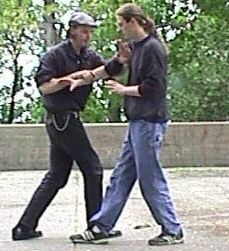 Defender brings his left hand up and smashes his left palm into the attacker's right ear (or base of skull), while he brushes the attacker's right hand down and across the attacker's center/Ibsi. In addition the defenders right knee engages the attacker's right knee from the outside line/Zagsi preventing the attacker from stepping. 3. 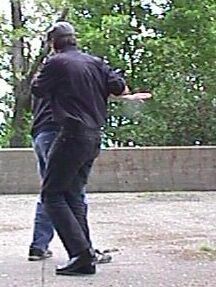 Defender shoves attacker's right shoulder forcibly, sending him flying away with his back to the defender (preferably towards a wall or another enemy). 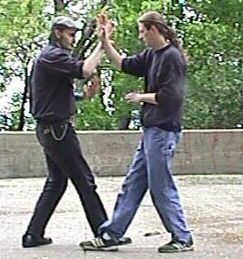 He also maintains control over the attacker's right wrist (this may lead to a lock or throw). 2. 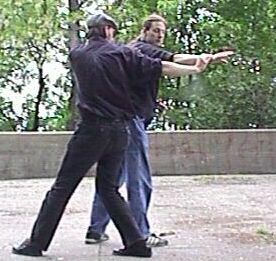 Defender brings his left forearm up under the attacker's right armpit, while he brushes the attacker's right hand down and across the attacker's center/Ibsi. In addition, the defenders right knee engages the attacker's right knee from the outside line/Zagsi. 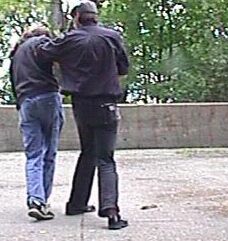 Often, in this instance we will bring the left knee in to strike the attacker's right knee. 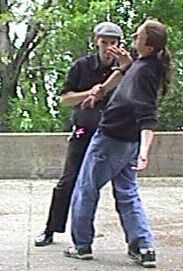 This creates a vicious cross step that the opponent can not resist (see STAND LIKE MONGOOSE step 2 / 3), but being on concrete, and not wanting to send my friend flying into the camera man, I used my right knee. 3. 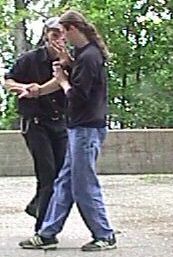 Defender uses a Half Circle Decompression (up &forward, down & forward) with his forearm towards the opposite shoulder to force the opponent to cross step (this would be followed by the defender kicking the opponent's left foot across the opponent's right center with his right foot for a smashing take down). Looking at the attacker's left hand in this photo, one might assume the defender is simply relaxed in cooperation, but the desire to break one's fall is so strong in this kind of situation (bent backwards) that his hand is rushing down to try to break his fall! 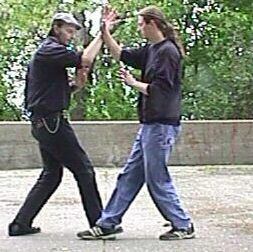 1.Defender (on LEFT) engages the right-handed attack with a split on the outside line (the defenders is in the Cobra Rises posture); opponent is trying to use Cobra Turns posture. 2. 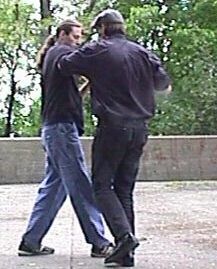 Defender brings his left forearm up under the attacker's right armpit, while he brushes the attacker's right hand down and across the attacker's center/Ibsi. In addition, the defenders right knee has slammed into the attacker's right knee from the outside line/Zagsi driving it to the opponent's left side. 3. Defender steps with his left foot into the Cobra turns posture (note the hip to hip engagement), while slamming his right palm up under the opponents chin. Looking at the attacker's left hand in this photo, one might assume the defender is simply relaxed in cooperation, but the desire to break one's fall is so strong in this kind of situation (bent backwards) that his hand is rushing down to try to break his fall!